The times when influence was solely held by gatekeepers like journalists and media platforms are long over. Influencers have taken over! The dynamics of influence have changed significantly, and supposedly every user can express their opinion on products and brands publicly, impacting others with their point of view. But does this shift result in a more democratic impact or does the Pyramid of Influence still show a certain hierarchy? The Pyramid of Influence divides consumers into four different levels. From top to bottom, the passion and interest for a topic decrease, while the size of the audience increases. Let’s take the vertical fashion as an example. On Instagram, fashion is the strongest vertical: Our InfluencerDB database lists more than 250k fashion influencers worldwide. This comes as no surprise since outfits and fashion pieces can easily be presented and authentically integrated into an influencer’s content on a visual platform like Instagram. The lowest level of our pyramid is called I Know It. This level assembles all users and consumers who do not perceive the respective topic or vertical consciously and do not spend time consuming it. Coming back to the vertical fashion, this indicates users who buy fashion for the sake of needing to get dressed, but without any actual interest in the fashion pieces they buy. They do hardly follow trends and their style revolves more around “I need to buy something” than “I want to buy this piece”. These consumers represent the mainstream and make up for the largest group of the pyramid. The second level consists of those consumers whose behavior towards a vertical can best be described as I Like It. Users on this level are consciously aware of fashion, spend time consuming it and might even see it as their hobby. Although fashion is not their main focus, they have an interest in trends and dress accordingly. They do, however, not spend more time or money on this vertical than on other hobbies. Level 3, I Love It, assembles those consumers who depict fashion as their favorite hobby and their biggest passion. These consumers use fashion to isolate themselves from other consumers and have extensive taste and expertise in the topic. They do have other hobbies as well but spend a significantly larger amount of time and money on fashion. On the highest level, I Live It, we find the absolute experts in a topic. These are consumers whose life and identity consists of this vertical and who define themselves completely by the topic. Fashion is more than a hobby for them. On the contrary, it makes up most of their everyday life: They spend most of their money and time on fashion and see this as their biggest passion. While traditional media is a one-way street, social media enables every user to act as a medium with the ability to spread messages and influence other users on a digital level. Consumers with a large reach place themselves effectively on social media with the potential of influencing other consumers in their decision-making process. Thus, through social media, consumers become media platforms themselves which transmit brand messages and wield influence. Our pyramid of influence shows on which consumer levels both individual influencers and traditional media platforms have an effect on. For the fashion vertical, we have Anna Dello Russo, editor at large and creative consultant of Vogue Japan, at the top. On the side of traditional media, Dazed & Confused magazine occupies this level. Both Anna Dello Russo as well as Dazed & Confused are niche, progressive media which mainly influence and inspire those consumers on the highest level of the pyramid. In contrast to traditional media, the influence is no longer a one-way street, but happens on exchange: Consumers and influencers inspire each other. Strictly speaking, influencers are consumers themselves and have less of a gatekeeper function than traditional media. In most cases, influencers and consumers influence each other solely on the level they are situated on. Influencers additionally have an impact on the level beyond. It is, however, highly unlikely that an influencer like Anna Dello Russo influences the consumer levels of I Like It and I Know It. The content she produces and the brands she recommends are too far away from what the consumers usually consume and show a lower fit. For other verticals, however, this might not be the case. Top-level player Cristiano Ronaldo, for example, has an enormous radiance and, thus, his influence reaches down into the mainstream. 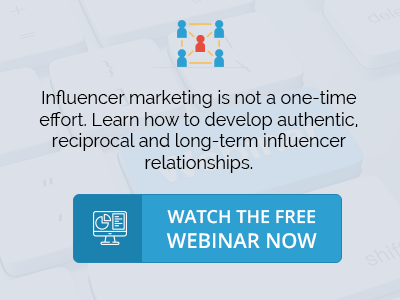 Watch our latest on-demand webinar to learn how savvy brands develop reciprocal relationships with influencers. With the emergence of social media and influencers, not only the influence of consumers and media platforms changed but new mechanics emerged when it comes to the cooperations between influencers and brands or companies. On the side of traditional media, relationship nurturing to journalists (public relations) is happening on all levels to a similar extent and ads are placed additionally (advertising). Obviously, this is only possible up to a certain point. Brands with a less luxurious image or have a lower fit towards the medium will have a harder time being published by Dazed & Confused or Vogue. Even the extensive use of financial resources will not change this fact if the journalists find that placing a certain brand in their magazine will stain the magazine’s reputation. The distinctions are, however, less strict than on the influencers’ side of the pyramid. The human aspect is the most considerable difference here. Influencers are located at the interface between people and media and evaluate potential cooperation with brands based on entrepreneurial criteria as well as emotional components. No matter how much money you’d offer, Anna Dello Russo would not promote brands on her channel which she is not convinced about. Influencers on higher levels of the pyramid are all about money can’t buy experiences. They are used as experienced experts for a vertical, testimonials, and brand ambassadors. Brands cooperate with these rather for their image than for their reach in order to transfer the influencer’s image onto the brand and charge the brand with emotional aspects. Influencers located on the lower levels of the pyramid are mainly used by brands for their follower numbers. Due to the influencers’ mainstream environment, brands focus less on image transfer than on using the influencers’ extensive reach. When identifying influencers, marketers need to pay attention to the level the influencer is located on. Keep in mind that influencers will mostly only have impact on consumers on the same level or a level below, but will hardly reach consumers on lower levels. Influencers located at the top levels are the perfect fit for influencer relations and to transfer their image to the brand, while influencers impacting the mainstream can ideally be used for their extensive reach to generate awareness of a brand.